The earliest edition of the New Testament in Spanish, translated from the Greek by Françisco de Enzinas (otherwise known as Dryander, or sometimes as Du Chesne, or Eichman, c. 1520-1552), a young Spanish student at Wittemberg, in the house of his tutor and friend Melanchthon, 1541-3. The Emperor Charles V prohibited the printing and distribution of the book and Enzinas was cast into prison at Brussels by the Emperor's confessor. In February 1545 he escaped and fled to Antwerp, whence he travelled to Wittemberg. Three years later he came to England, where Archbishop Cranmer obtained for him a professorship of Greek at Cambridge. Eventually he returned to Germany and died at Strassburg in 1552. 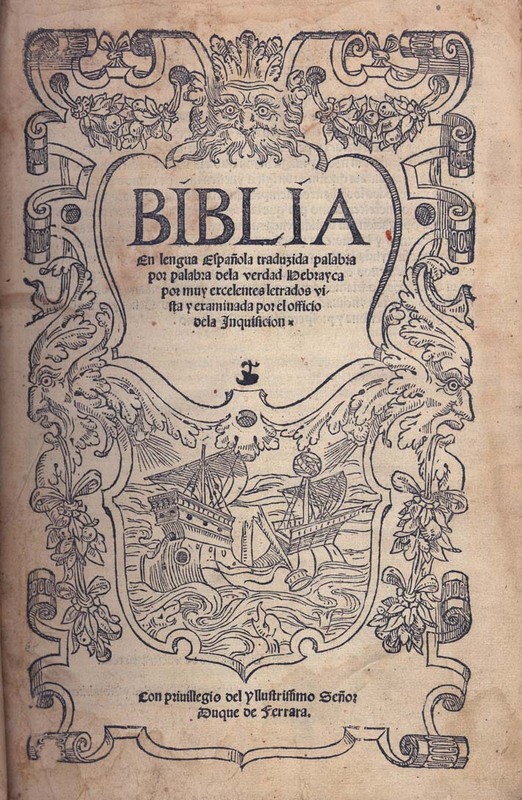 Owing to the suppression of this earliest Spanish New Testament very few copies have survived. 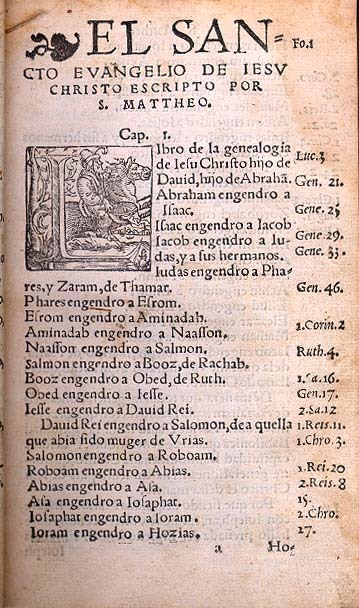 The first edition of the Hebrew Bible in Spanish, known as the Ferrara Bible, was intended mainly for Jews who had been driven from Spain in 1492. 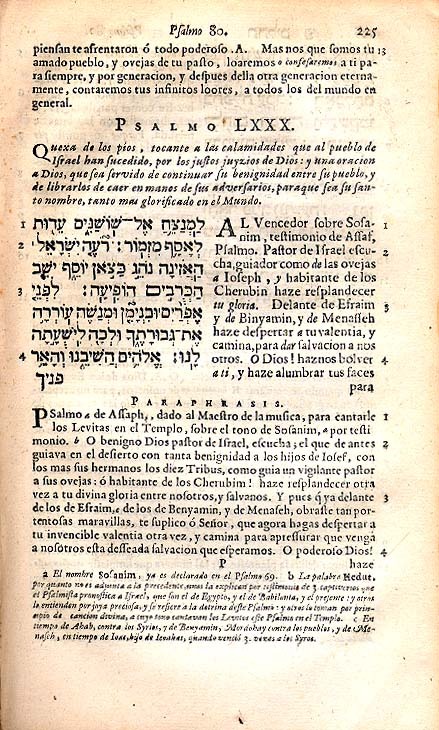 It appears to be a revision of an old Jewish version, and on account of its aim, which, according to the preface, was to reproduce as closely as possible the meaning of the Hebrew original, it may be considered an early testament to a peculiarly Jewish Spanish, or Ladino as distinct from Castilian. The work was edited by Abraham Usque (otherwise Duarte Pinel), a Jew from Portugal, and published at the expense of Yom Tob Atias (otherwise Jeronimo de Vargas), from Spain. It was produced under the protection of Ercole d'Este II, fourth Duke of Ferrara. A literal translation of the Psalter together with a paraphrase and annotations by Jacob Judah Aryeh Leon Templo the religious leader of the Spanish-Portuguese Jews of Amsterdam in the mid-seventeenth century. He caused something of a stir by drawing a plan of Solomon's temple which he published in 1642 under the title: Retrato del templo de Selomoh. One of the laudatory poems in praise of this his last work is a sonnet by the highly colouful Marrano poet Daniel Levi (Miguel) de Barios. A remarkable figure who, during his long life was both a captain in the army of the Spanish Netherlands and, from 1674, a member of the Amsterdam Jewish community. A copy of the Song of Songs, which is traditionally recited during Passover, in Hebrew with a Ladino translation. The Sephardim, or Spanish-Portuguese Jews also recite it on Friday afternoons to welcome the Sabbath. It was printed by the the firm of Bragadini, which dominated the Venetian Hebrew press from the middle of the sixteenth until well into the eighteenth century. It is one of 193 books purchased from the library of Dr Ludwig Blau (1861-1936), Director of the Jewish Theological Seminary of Budapest. 'Kuanto fue dimudada la noche la esta mas ke todas las noches?' (What distinguishes this night from all others?). So begins the Ladino translation of the four questions posed during the Passover meal in this mid-nineteenth century Haggadah, adorned with woodcuts. It was printed in the major Sephardic centre of Livorno (Leghorn). In the sixteenth century the Duke of Tuscany invited converted Jews (Marranos) to settle in the Italian port, where they were at liberty to revert to Judaism without the ignominy and restrictions of the Ghetto system enforced elsewhere. Up until World War II Livorno supplied North Africa and the Levant with liturgical books.